Keep up to date with all our latest news and events, and watch our tax department's informative videos. Training on the job is a great way to learn. Each year Chartered Accountants and Chartered Tax Advisors, Warrener Stewart, offers employees training to become a tax specialist or Chartered Accountant. “Training on the job helps our employees translate theory into practice. Learning to adapt and react to real business situations while applying new knowledge helps our trainees become better accountants and tax advisors. Fresh from graduating with a degree in economics at Manchester University, Helena started out in marketing for a start-up business before deciding to put her numerical and analytical skills to use by becoming an accountant. After nine years Liz Henry was ready to move from her demanding role supporting the directors to take up the challenge of training to become a tax specialist. “For the past nine years I’ve supported the tax department in a variety of ways. It seemed like a natural progression to grow my responsibilities and start studying for the ATT qualification,” says Liz. By investing in their people Warrener Stewart is providing the best possible service to their clients. The arrival of the new year once again heralds the deadline for self-assessment tax returns. In advance of January’s tax deadline and the last-minute rush to complete self assessment tax returns, Fulham based tax accountants, Warrener Stewart has recently recruited another chartered tax advisor, Caroline Stoclin. Following a four-year degree studying both French and English law at King’s College London and La Sorbonne, Caroline started work as a solicitor in Paris, where she worked for the prestigious multinational luxury goods conglomerate, LVMH. Upon moving to London to be with her family and raise her three young children, Caroline completed her training to qualify as a Chartered Tax Advisor (CTA). It was during her degree course that Caroline decided to specialise in tax, enjoying the problem-solving aspect, alongside understanding regulatory compliance. Rather than working within a large corporation, Caroline wanted to join a company like Warrener Stewart who advise many SME’s and owner managed businesses. “At Warrener Stewart I have the opportunity of liaising closely with clients and using my knowledge of corporation tax and VAT issues to help a wide variety of clients,” noted Caroline. We hope you have a Happy Christmas and a prosperous New Year. Our offices will be closed from Monday, 24th December until 2nd January 2018. This year instead of sending cards we have made a donation to St Mungo's, who work to tackle the causes of homelessness. Already an excellent team of accountants and tax advisors, several members of Warrener Stewart put their team skills to the test recently when they took the oars of a Cornish Pilot Gig. The 32-foot-long wooden, six-oared boats are traditionally used along the Cornish coast as pilots and lifeboats. 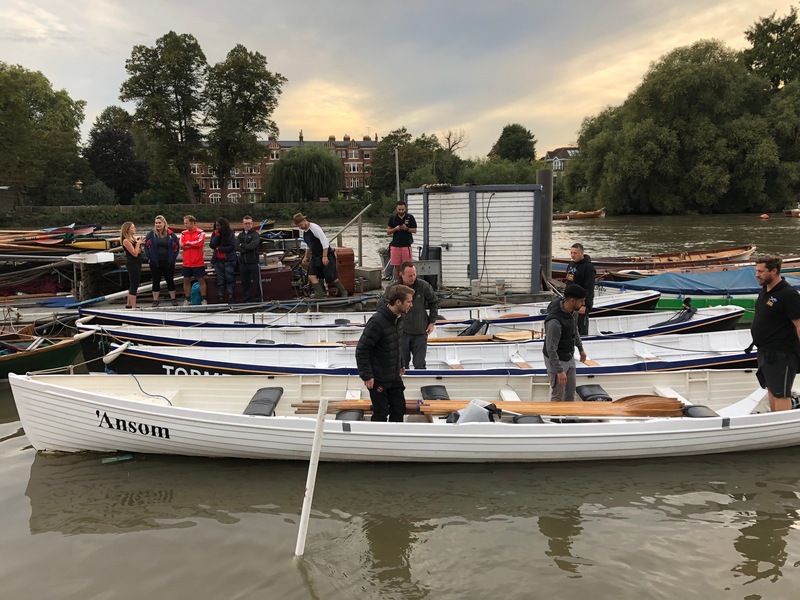 The Fulham accountancy practice got to row a more local version based on the River Thames at Richmond with London's first Cornish Pilot Gig rowing club. Under the strict, but gentle supervision of a former colleague, a founder member of the club, and her fellow clubmates, the novice rowers had to learn quickly to row these sturdy vessels. They travelled upstream against the tide to relative safety at Eel Pie Island, Twickenham, before the strong running current took them rapidly in the opposite direction!. “The technique of rowing the Gig was fairly straight forward,” commented Damian, who when trying not to rock the boat heads up Warrener Stewart’s American tax department. Having rowed a mile or two upstream from Richmond Bridge, the team stopped (a little too long!) to take on water at a conveniently situated riverside hostelry, before having navigate their way back just as the sun was setting! Warrener Stewart is offering the opportunity to embark upon a career in accountancy by joining their thriving Fulham based practice as an Accounts Assistant. The role is an ideal way to study whilst working full time, as Warrener Stewart will additionally provide study support either to start AAT training or to complete an AAT qualification. “Studying for this practical accountancy qualification, whist being part of busy accountancy practice, is the perfect way to appreciate and understand more about the accounting industry and to start a career without the requirement to hold a degree” notes senior Principal Gary Chapman.